These large 32-ounce quart-sized glass Growlers are the best choice for so many things in your kitchen or cellar, from fermenting kombucha, to preserving, brewing or simply attractive, easy-to-see beverage or liquid storage. The easy to open, rustproof, BPA-free, polycone caps seal tightly, preventing contents from spoiling. 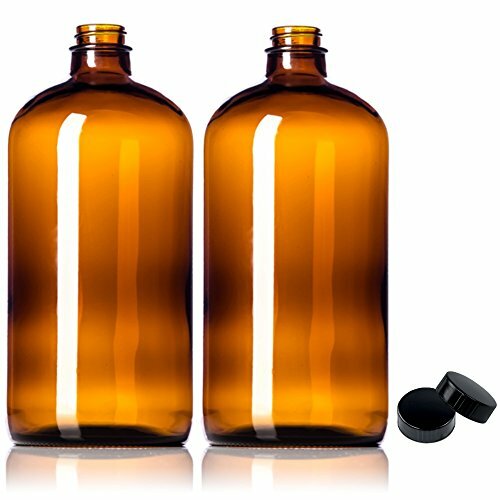 Our Growlers are made from Amber, lead-free, borosilicate glass and are dishwasher safe for your benefit! Enjoy these multi-purpose Growlers for all your needs! REFILL your growler with whatever you make at home. Perfect for storing fermented drinks like Kombucha! SECURE BPA-FREE CAP. BPA-free, black, polycone, phenolic cap provides a rust-proof alternative to corroding metal lids. Easy to twist on and off! ORDER ONE NOW and if you are not absolutely satisfied for any reason, simply contact us and we will happily refund your money!